The Innocence and Spontaneity of Not-Knowing. Francis doesn’t deliver a pre-planned presentation. He speaks instead in the spirit of the moment, answering questions from the audience from the innocence and spontaneity of not-knowing. Even if you’re more than a dabbler in the art of manifesting, the skill — like any skill — can always be honed and improved. For the unfamiliar, manifesting is the practice of tuning your body and mind’s energetic vibration to a high frequency. That may sound heady, but we’re all beings of energy. When our energy vibrates at a low level we attract low-level circumstances. But when our energy is in a high vibration we attract positive outcomes. If you’re ready to take your manifesting skills to the next level, first cultivate a greater sense of knowing with these three steps. To manifest you must be able to feel the feeling of the experience before it even happens. How do you access this groovy feeling? It’s simple, use your imagination! Sit in stillness and think your way into the experience that you want to create. Let your imagination guide you to tap into the images you want to see and the feelings you want to feel. Your imagination is your greatest resource for creating new experiences in your life. Spend five minutes a day practicing this imagination exercise. In time, through the imagination process, you’ll feel what it’s like to experience your desires. Write down clearly what that feeling feels like. In your daily life, do whatever it takes to tap into that feeling. For instance, if you’re manifesting more money, focus your attention on everything you already have to cultivate a sense of abundance. Or if you’re manifesting a healthy body, make time to move more and energize yourself. Featured in the New York Times Sunday Styles section as “a new role model”, motivational speaker, life coach and author Gabrielle Bernstein is making her mark. Expanding the lexicon for the next generation spiritual seekers, Gabrielle is a #1 bestselling author of the book Add More ~ing to Your Life — A hip guide to happiness. September 2011 Gabrielle launches her second book, Spirit Junkie, A Radical Road to Self-Love and Miracles. In 2008 she launched her social networking site HerFuture.com for young women to find mentors. HerFuture’s growing community exceeds 12,000 members. Gabrielle has been featured in media outlets such as The New York Times Sunday Styles, ElLE, Oprah Radio, Marie Claire, Health, SELF, Women’s Health, Glamour UK, Sunday Times UK, Forbes List: 20 Best Branded Women, Featured on the Cover Self-Made Magazine (top 50 Women in Business), CNN, Fox & Friends, PBS, Wall Street Journal, AdWeek, Sirius Satellite Radio. Gabrielle is a regular contributor for Metro, The Huffington Post, Beliefnet, Yourtango.com, TheDailyLove.com, PositivelyPositive.com, Intent.com, Crazysexylife.com, Feminist.com among others. She can also be seen riding around the East Village on a unicycle. Q: The International Day of Yoga is June 21. Where will you be? Sri Sri: New York. I’ll be speaking at Lincoln Center. I think it’s very much in the DNA of America to do yoga. It can bring health, sharpness of intellect, creativity, emotional stability and a broad vision, which America has always stood for. The U.S. is a very progressive country, very dynamic, very forward thinking. Q: What would you like people to know about Yoga? Sri Sri: Yoga is like a vast ocean. You can just go for a breeze, or you can go with an oil rig and drill for oil … Yoga offers many things to different people at many different levels–whatever they aspire for: union with the cosmic consciousness, or physical health, mental clarity, emotional stability, spiritual ecstasy — all this is part of yoga. Q: Does it concern you that people think of Yoga only as asana [the familiar physical postures]? Sri Sri: Not really, because at that moment that’s what they understand. But once they start doing asana they start seeing there is something beyond that. If interest for meditation gets kindled, then they are on the right track. But if it stops at exercise … it’s not bad, but they will not reach the goal. Sri Sri: I knew you would ask about that. Unfortunately, people think the eight limbs are eight steps, one after another. You know, when a baby is born it’s not that one limb develops after another. All the limbs develop simultaneously. The eight limbs of Yoga are so interconnected, if you pull one all the others will come along with it. Sri Sri: The limbs are not sequential, they are all together. The practice of the others contributes to the ability to observe the yamas and niyamas. When we teach meditation in prisons, we see that the moment they have a taste of meditation, their whole thought process and behavior pattern changes. They start on the path of non-violence. They become very truthful, and the tendencies to cheat disappear. So the yamas and niyamas start happening in people’s life just when they begin meditation. Q: How do your Art of Living programs fit into the eight limbs of classical Yoga? Sri Sri: Yoga would be incomplete if even one limb is absent from it. All the eight limbs coexist. Our program is the same way. We do some asana, and some pranayama-breathing exercises-and meditation that leads to samadhi [the 8th limb; not a practice but a state of consciousness transcending thought]. Q: Dharana and dyana are the sixth and seventh limbs. How do you explain the subtle distinction between the two? Sri Sri: One leads into the other. Dharana is having the attention on a particular thing, and dyana is how the mind from there dissolves into samadhi. Q: A lot of people translate dharana as concentration. Sri Sri: Absolutely not. Concentration is an outcome of meditation. Dharana is attention — not tension; in concentration there is tension [laughs]. Q: Have you run into opposition or resistance in the U.S.? Sri Sri: In the beginning we had a lot of resistance, and prejudice. But it’s much better now. Yoga is much more accepted. Today, car companies use meditation and yoga postures to sell their products. Q: How is the acceptance of India’s spiritual traditions in India itself, as the country modernizes? Sri Sri: The younger generation is taking to it now. One generation previous was a little skeptical. The media also played a role. Now it’s different. People see the practical benefit. Q: There is a lot of concern in the press about the protection of religious minorities in India. Sri Sri: I think the fear is unfounded. Minorities have always been in good favor in India. For centuries they have been protected. The people-to-people connection is very good. There is a certain amount of polarization for sure, but not to the extent that minorities should be afraid of anything. Q: What about the conversion issue? Sri Sri: I think conversion should be from head to heart, not from one religion to another religion. I feel people should become more spiritual — rise above the religious differences and come together in the spirit of vasudhaiv kutumbikam: The world is one family. In this conversation Deepak Chopra shares with us his personal journey in the exploration of consciousness. In this conversation Deepak Chopra discusses consciousness through the lens of different spiritual traditions. A conversation with Rupert Spira about the unfolding of his realization. Jesus crossed all of the boundary lines that separated the people of his time because he viewed the world from the perspective of what unites us, not what divides us. 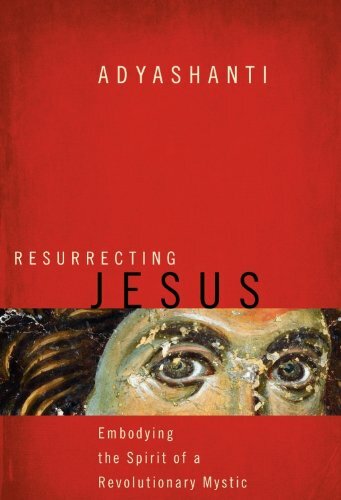 In Resurrecting Jesus, Adya asks us to consider the man known as Jesus as a model of enlightened engagement with the world. He examines the story of Jesus from his birth to the Resurrection to reveal how the central events in Jesus’ life parallel the stages of awakening that we may be called to experience ourselves. Adya then illuminates five central archetypes of the Jesus story—Peter, John, Mary Magdalene, Judas, and Pontius Pilate—and the key insights they hold about the way we might relate to the spiritual impulse within. Our journey concludes with an inspiring call to “live the Christ” in a way that is unique to each one of us. “When the eternal and the human meet,” writes Adya, “that’s where love is born—not through escaping our humanity or trying to disappear into transcendence, but through finding that place where they come into union.” Resurrecting Jesus is a book for realizing this union in your own life, from one moment to the next, with heart and mind wide open to the mystery that lives inside us all. Asked to teach in 1996 by his Zen teacher of 14 years, Adyashanti offers teachings that are free of any tradition or ideology. “The Truth I point to is not confined within any religious point of view, belief system, or doctrine, but is open to all and found within all.” For more information, please visit adyashanti.org. Adyashanti – My heartcore in Christianity? Great talk from a retreat at Garrison with Adyashanti.